Mike Rimmer met up with Chicago trio 21:03 and discovered it's been four years of hard work leading to the R&B gospel team's debut. The front sleeve on the debut album by R&B gospel group 21:03 boldly proclaims 'PAJAM Presents . . .' Now, as any urban fan will tell you, PAJAM (Paul 'PDA' Allen, J Moss and Walter Kearney) are one of the hottest production teams on the US scene and their presence behind the recording desk guarantees a rich blend of streetwise beats and radio friendly hooks. And with 21:03's rich harmonies recalling the glories of those late '80s R&B boy bands like Boys II Men and Color Me Badd given full reign on their 'Twenty One O Three' debut this group seem destined for the big time. In a hotel in downtown Nashville, the three members of 21:03, Sean Grant, Evin Martin and Torrence Green, are sprawled on a king sized bed, waiting to answer my questions. The label have even sent J Moss along to talk about things too. I started with the guys as they told me about their unusual name. Grant responds, "21:03 is the concept date that PAJAM came up with.that's the date that God gave them the vision for our group. January 21st 2003." The idea for the vocal group was birthed by PAJAM so to a point, it could be argued that this group are manufactured. But in these days of Pop Idol and Fame Academy, it's become an acceptable way for a group to be formed and launched. The trio were all born and bred in the city that has spawned more gospel singers than any other - Chicago! So if you're going to be a gospel group that's the best place to start right? "It's certainly the most intimidating place," comments Evin Martin, "because you can go to church on Sunday and Karen Clark Sheard is just singing her head off! You know what I'm sayin'? You go to another church and Fred Hammond has got everybody in worship! So it's a good testing ground because if you can't make it there, whatcha gonna do?" So how did the guys at PAJAM discover their talents and put them into a group? "The cool thing about it is," relates Sean, "Paul Allen from PAJAM goes to my church and Walter Kearney goes to Torrence's church. We were found at our respective churches. And through a period of auditions, boot camps, vocal training and choreography, things like that, we were the ones that had the special gift. And the ones that lasted the longest! So we're the ones that are here." Aha! So 21:03 is a manufactured group in a similar ilk to anything you'd get at Fame Academy only the process didn't happen on TV. Evin responds, "Well, you can say that we're manufactured but the great part about us is that no one tells us what to wear. No one says, 'This is the vibe that you must portray.' The people that you're getting here right now are the people that we are. We don't have to put on a fake personality and say: 'Okay, well you have to be like these people because you're a Christian group. You need to walk like this.' There is media training and things like that but our songs are inspired from real life situations that we went through. All of the ad-libbing and the total vibe of our group is not manufactured. And it's not manufactured because it's a God thing." Torrence takes up the theme, "Right. And that's what I think every time we get that question: 'What made you stand out?' I just think that, I KNOW this is what God wanted us to be, you know what I'm sayin'? God appointed us for this and when God places you somewhere, it's just where you are. That makes you stand out in itself. God chose you for this. We've got a song, it's called 'Chosen' and it says, 'Time for the chosen to go get your blessing.' If God put you somewhere then you accept your call and you walk in it. And that sets us apart because we doin' our thing for Jesus. He got our back. He's exalting our ministry. 'Manufactured', it just don't sound good, you know?!" Well, to be honest the accusation wasn't meant to sound good. Like many music critics, I have an in built dislike of manufactured pop because it tends to lack artistic integrity but I'm willing to have my mind changed on this one! Sean responds, "We put ourselves into this group. WE put our blood, sweat and tears. WE rehearse. WE do everything we need to do. Like he said, we pick what we want to wear. PAJAM is pretty much here to nurture the gift. We sit in sessions and we're cultivating our craft. That's why we're learning instruments, writing, things of that nature. But as with anything a seed needs water to grow. So we're the seed and PAJAM is the water, or the sunlight." So where's the dividing line between nurturing and manufacturing? I can see it nurturing your talent but PAJAM does have quite a strong musical personality in terms of the production style and the kind of vibe that they create. Isn't there a danger that they will fit the group into their box? Evin doesn't think so. "We all come from the urban situation," he says. "So PAJAM, they're known for their urban things. But the great thing about each of us is, we like very different, diverse styles of music. So when we got in the group it was like, 'What kind of music do you like?' Well I come from more of a worship, Delirious?, Michael W Smith, Hillsong, Darlene Zschech type of background. That's the type of church that I go to, along with Byron Cage and Fred Hammond. So when you put me in a group you can't find anything but a different sound. And that's what our album represents. Our album is very versatile. You have CCM pop ballads, such as 'See Me' and 'Power Of Christ'. And then you have Torrence who comes more from the urban side." Torence says that he loves the urban side of things and he loves Tonex. Sean explains that he got saved late so he had a lot of non-Christian influences. But he doesn't seem in the mood to tell me specifically about them, instead he talks up the album again. "We have so many different sides to us," he says, "and so many different styles of music that we love. That's why it's for so many different audiences." Torrence chips in, "The public will be very surprised when they hear our album. I think even PAJAM would admit that they stretched themselves, production-wise, going in a different direction than normal. It was always in them but now they just have the chance with this group to go in that different direction. I think the public will be very pleased." As for the group members' backgrounds, Evin was a deacon's kid and raised in a Christian home. He says, "The church was always in me and I always went but there was a point when I just had to say, 'Lord, what is this really all about? The God of my mother. The God of my father. Who are you? And reveal yourself to me.' And that's what he did." Evin was 14 when that happened. Torrence was also raised in church. "But I had my time when I was a teenager." He explains, "I rebelled. Went my own way. Tried to do my own thing. But God, he found me. When I was six months old my mom left me with my grandmother and I had to deal with that whole thing. My dad wasn't really around. So it was hard growing up. You needed somebody to look up to and there wasn't really anybody to turn to. So being in church, looking to God; God was the person I could look up to. It took me a bit to get that but now that I got it, I'm holding onto it!" Sean had no church background. "It was hard for me," he remembers, "because when I started going to church, I didn't really 'get it', so I was still doing stuff I shouldn't. Then when I really started getting into it my mother saw that and it would be like my punishment. Like, 'Your room isn't clean! You can't go to church on Sunday!' So it really became a privilege for me and that's why I love God so much. Because I had to fight. My mom was like; 'Oh he's going to that cult!' You know? I had to prove to my family who God is." Were Sean's family shocked when he became a Christian? "Yeah definitely. Even when I started singing gospel they were like, 'Why are you singing gospel?' It was crazy but it was worth it. And now my family's comin' along. People are getting saved. It's off the hook!" Do the mixed backgrounds of the group help when they are ministering in concert? Evin thinks it's great. "There are, as they say, different strokes for different folks. And everyone is not at church yet. There is someone for everybody in our group. It's crazy because it wasn't, as you would say, 'manufactured' in that way. Sean and I knew each other previous to the group. And so did Torrence and Sean. So when we all came together it was like, oh wow, we had a myriad of different experiences! Now we're able to relate to the kids that come to us and say, 'I've been in church all my life and I still don't know who Jesus is.' I can speak to them and say, 'Well, this is what you do. This is what I did. This is what happened for me.' Then there are people like Sean who say, 'Well, I've had no type of Christian upbringing.' So it's great for us to be able to, at autograph signings or even when we're on the stage or on the pulpit, to just say okay, we know where you've been. We have a song called 'I've Been There', that speaks directly to those people to say, we know what you've gone through but you can make it out. You'll be all right." So what is it that the group want to do with their music? They're at an exciting time of their career with a debut album freshly released, working with one of the highest profile gospel production houses. What do they want to see happen through their music? Elvin responds, "Man, we're just expecting the unexpected. We expect to reach people; bring light into dark situations. We want to show the love of God and bring that message that no matter what you're going through God can help you. God can bring you through it, you know? We should allow our lives not to just be spoken words but to live what we say and what we sing about and what we teach about. So that people could identify with all our different stories and situations that we've been through. So it's bound to be an awesome experience!" All very worthy, of course. But their response does seem a little generic. I push them a little to see whether they have any more specific ideas of what they want to do. Torrence shares, "We really are excited about the diversity on our album and a chance to be able to bridge black gospel and CCM. We're on a soundtrack called 'Second Chance Soundtrack' with Michael W Smith, who is like THE biggest person in CCM ever. So for him to do something with a 'black gospel' or 'urban' group. . .! The whole movie in itself was about bridging the culture so I think the industry is going to move more toward that. I think that's a goal of ours, to help do that. To help bridge the gap." Evin chips in, "We don't want to be just a group doing music. I mean, we were walking past the Habitat For Humanity booth and we were talking about signing up to do the work, to be the body. We remade a song by Casting Crowns called "We Are the Body". We're very adamant about being the hands and the feet in ministry and not just singing." At this point, J Moss from PAJAM makes an entrance and plonks himself down in an armchair. I've met Moss before and he's the most enthusiastic bloke you could possibly meet. I was interested to find out what his perspective on 21:03 might be. What was it about the group that attracted PAJAM? His response is surprising. "We didn't know!" he says simply. Hang on, that doesn't sound right does it? You didn't know? Apparently this is a good thing. Moss explains, "That's the beauty of it. When we go to select a group, select an artist, we look for that undefined, that unexplainable character that you really can't put your finger on but you just know they were destined to be stars. And that's what they had. Started off with about six or seven guys first but then they began to fall off and the real, real hungry ones remained. And that's how we ended up with Evin, Torrence and Sean. I think they have the potential to be much better, much greater artists than I'll ever get a chance to be. They got a 10-year head start on me, just in terms of being able to come out with this type of machine behind them. And they're just great. And these days gospel music is a lot more embracing to their type of music, the dancing, the choreography." He continues explaining his perspective on the scene, "The young people in gospel have really grown. God has blessed Kirk Franklin and artists like that to open up a lot more avenues that these guys can really go in to and capitalise on. So I think it's gonna be great for them. We're real proud of them and we're just trying to keep them humble and keep them wise and make sure that they don't do dumb things that can allow them to ruin their career. That's what big brothers and management is for; to try to help them and steer them. But they're a good group of guys and they love the Lord. So we're expecting them to go far." It's been nearly four years since PAJAM first thought of getting a group together and launching them onto the scene. It's been four years of hard work and now 21:03 have emerged with a debut album. All we can do now is see how far they will go. They have talent and a great production team behind them but the gospel scene can be a fickle thing, just ask Winans Phase II! 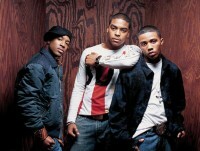 PAJAM ( PDA, J Moss ) i love your production, you rock the church boyz! i just want to tell you guys to continue to let the Lord use all of you. It goes without saying that you guys and your music are great! i just want to tell you guys to continue to let the Lord use all of you. wow 21:03 are great! there music is inspiring, touching and in my opinion has a very positive effect on anyone who hears it. all over the world people are singing your songs in thier churches (including me) which goes to show that gods gift of voice was truly destined for you. i love the songs: now, you, everybody can't go, im sorry and many more. i hope to hear a lot more songs like these on future albums. god bless 21:03 and keep up the brilliant work. i love the fact that you guys are christian artist! many people don't realize that all talents and gifts come from God , so many artist choose to use their talents, gifts, and abilities in the secular world which often times leads people astray. so whenever i discover a new cool/hip CHRISTIAN group that helps lead souls to JESUS CHRIST and has a tight sound i have to check it out! so be encouraged! and be strong in the LORD and in the power of his might! whats up my name is joe i now its hard to be in the singing. one day u will see me on a albom god bless all of u .